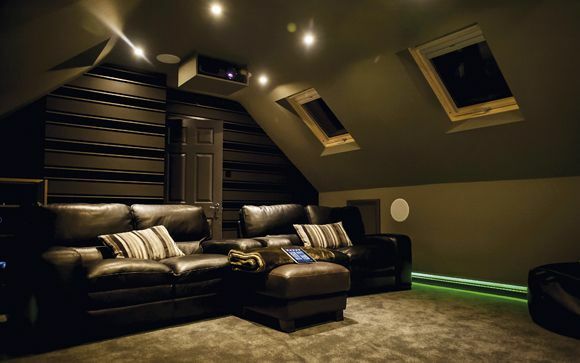 That's certainly the aim of this slick room designed and fitted by Dutch install corp De Opera Domotica, for an owner who wanted somewhere to enjoy bigscreen images and surround sound, but also a living space fit for the grandchildren to play in. The room hides its AV secrets well. All speakers are housed in-wall or in-ceiling, including the dual 8in Totem Acoustic subwoofers. The array runs to 9.2, with power amplifiers from Wisdom Audio joining forces with a Denon AVR-X4520. Motorised KEF in-ceiling models (Ci200.3QTs) descend from their hidey hole when called for, thanks to in-built IR. Projection is delivered straight onto a purpose-finished wall from an Epson PJ that lurks in the ceiling. For more casual viewing, a Samsung 4K TV resides in a side-slung AV cupboard. Control, meanwhile, is state-of-the-art. Crestron integration not only kickstarts the PJ and dims the lights, but takes charge of blinds, underfloor heating, air-conditioning and even the fireplace. Hot stuff!